Mt. Rainier through clouds and haze. Get ready for a challenging and scenic ride! The Summer 600 km route starts at AAA Washington headquarters at 3605 132nd Avenue SE in Bellevue. Secure free parking is available to all participants. Bring a drop bag for the overnight control and, if you’d like, another one for the end of the ride. You will have access to rest rooms and showers (with towels). Given the heat and smoke we have seen for the past several weeks, there was some concern about what we – Tom Beck, Jim Ryan, and Eddie Bishop – would have to endure during the pre-ride this past weekend. While there was still some smoke in the air, it only obscured the views. The morning was cool and crisp, and more layers of clothing would have been a good idea because it took quite some time before the temperature warmed up. The first part of the ride takes you from Factoria (initially via bike path) to Coal Creek Parkway through Newcastle and Renton to the Cedar River Trail. Don’t forget to exit the Cedar River Trail before Testy Chef (mile 16.6) – be careful of the loose gravel. In Maple Valley, there’s a Starbucks on the left at mile 20.6 in case you need a shot of caffeine. There are also services in Black Diamond. The shoulder goes away on the Green River bridge deck (mile 26.7), so stay alert and take the lane. In Enumclaw, there is a QFC on the left and a park with Porta-Potty on the right. Use care making the left turn onto 410; you have a stop sign and cross traffic does not. Unfortunately for all you Egg McMuffin fans, the McDonalds in Enumclaw is currently closed for renovation. Plan accordingly. The road to Cayuse Pass. Top-up water bottles and snack packs at Greenwater because it’s a long climb to Cayuse Pass and a long ride down to next control in Packwood (47 miles and 3,500 ft of elevation gain). On the pre-ride, the Greenwater General Store was low on stock. If you can’t find what you’re looking for, there’s more to choose from about 100 yards farther up the road on the right. Enjoy some spectacular views of Mt. Rainier as you climb to Cayuse. Once you reach the pass, keep right at the huge Y to follow highway 123 toward Packwood. Do not follow 410 left up toward Naches. In Packwood, there is a convenient convenience store, where you can get your card signed and enjoy the usual rando food. They also make great sandwiches to order If you’re in need of water or a bathroom, Ohanapekosh Campground (mile 86) has restrooms and water. 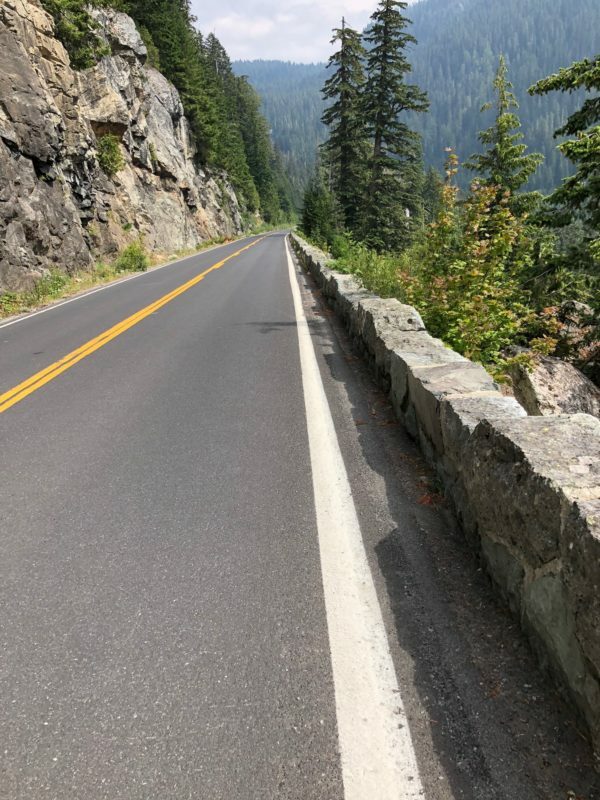 Expect headwinds between Packwood and Randle on highway 12 – winds are much less noticeable once you make the turn from Hwy 12 onto Silverbrook Road at mile 108.3. Leaving Randle, top-up again. You get about a mile of flat terrain before the climbing starts. There is an initial steep section, followed by miles of rolling terrain – some really great riding through here. The second half of the climb is more work for the legs; road conditions on the climb are good, and there are ample turn outs to pull off for pictures or a quick break. Be prepared for anything weather wise – and expect colder temperatures at the top. If you make it to Elk Pass in daylight hours, you’ll have a couple of amazing scenic vistas of Mt. St. Helens, but you’re going to want to pay very close attention to the road surface to get there safely. The descent of Elk Pass has cracks, uneven pavement and slide damage, along with some smooth stuff. In the dark you will want to be especially careful. If you have a high intensity light setting, this would be the time to use it. The good news is it’s a lightly traveled road and traffic should be minimal. Take a left turn at mile 160.4 to get to the Northwoods control (Eagle Cliff Store and campground). After you make the left, cross the bridge and start looking for an uphill gravel driveway on the left 1/2 mile after you made the turn – that’s your control. After checking in, head back the way you came – cross the bridge and turn left – at this point NFD 25 becomes Hwy 90. The store closes at 8:00 p.m., but this control will be staffed for all but the very fastest of riders. Eddie Bishop will be there by late afternoon. Restrooms are unlocked but unlit, so you might want your headlamp at night. There’s about 75 km to the overnight control and nothing in between, but it’s flat-ish and the air should be cool, so you may not need much. Hwy 90 is a fun road; it parallels several lakes – first Swift Reservoir, then Yale Lake, then Lake Merwin, along with the Lewis River in places. Around mile 175, Hwy 90 changes to Hwy 503 – you don’t even need to turn your handlebars. Hwys 90 and 503 have some climbs, some rollers, some great flat sections, and twists and turns. You’ll be riding in the dark, and the road has no shoulder; stay alert and make sure your taillights have ample power. The town of Cougar has services, but only if you get there early enough. The gas station on the left as you ride through town has a picnic table with umbrella if you need a place to sit and take a break. The overnight control will be Best Western in Woodland. It’s close to, but not directly on, the road, nestled among some industrial-looking buildings. However, it was easy to find in the dark. There will be food available at the hotel. If you don’t care for what’s offered, there are several restaurants in close proximity. After Woodland, you head to what may be the crown jewel of the pain cave – Green Mountain Highway. Your legs will get about a 10-minute warm up. Is it a long grind like Cayuse Pass? No. Is it a combination of long climbs and shorter flat sections like Elk Pass? Well, no. It’s a couple of miles of graduated climbing ranging from 8% to 15%. Once you get to the top (however you choose to get there – on foot, paperboy, full-gas straight line, or secret granny gears) you’ve got a few spots of tricky descending to do. 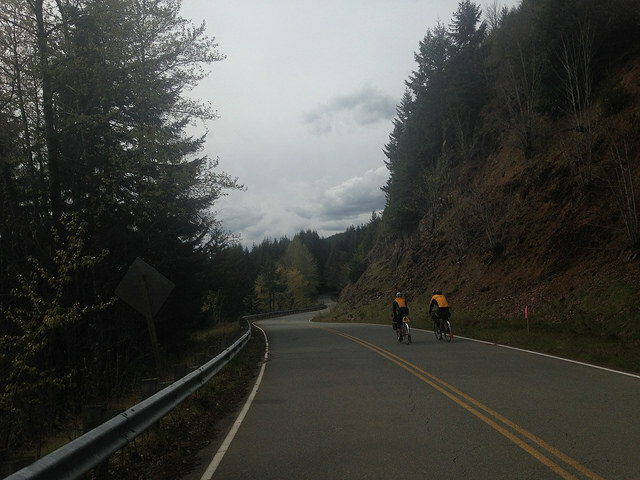 At mile 211.8, while flying down the hill, you have a sharp, tight downhill turn to stay on Green Mountain Hwy. Again, around mile 213, you start down a steep grade and there is a 90-degree right-hander – if you overshoot the turn you’ll ride into some guy’s living room. Bottom line: There are a lot of tricky sections descending Green Mountain that you’ll need to be alert about. In the next section you’ll be riding parallel to I-5 with rollers, decent roads, and wide shoulders (watch for occasional glass and debris). There are services in Kalama and Kelso. These towns can have a lot of traffic – even on a weekend – especially Kelso around mile 230 (a popular I-5 exit for motorists seeking services). Be mindful and watch for inattentive drivers. You’ll enjoy rollers after Kelso on Pacific Avenue, and later when it becomes Bond Rd. In a few places you’ll cross intersections with I-5 access – be watchful as we saw a lot of morning traffic at all of these. Your last I-5 intersection is around mile 249 by Peppers Truck Repair (truck stop across the street) – you’ll cross I-5 and then make a left onto Jackson Hwy South and head to Toledo. At the control in Toledo, mile 255, you’ll find services including a mini-mart, IGA market, and some restaurants. This is where the pre-ride ended. The next 80 miles has all the climbing that is left: You’ll ascend and descend just over 4,000 feet as you ride through Mossyrock, Morton, Elbe, Eatonville, and Orting. 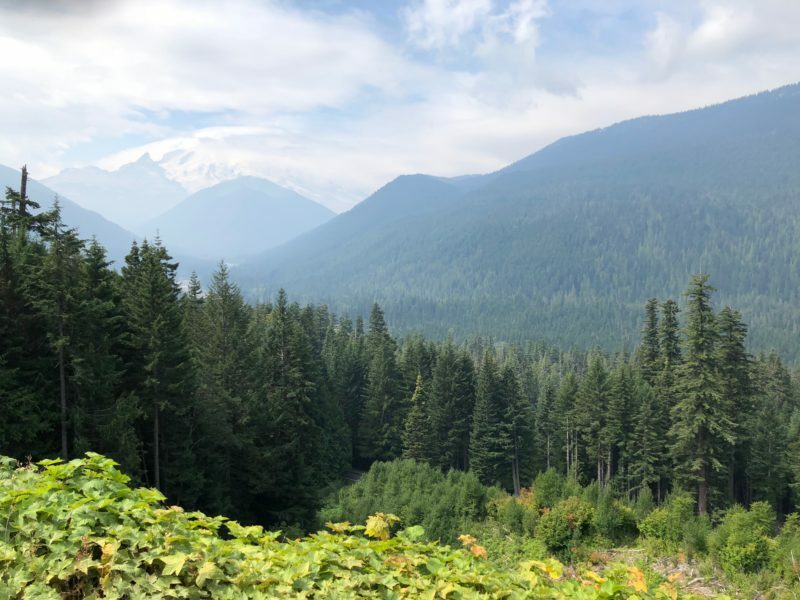 These roads generally have good shoulders, but watch for holiday traffic given the proximity to Mount Rainier National Park and Mount St. Helens. You’ll be greeted and congratulated finishing at AAA where you can get a little food and something hot or cold to drink. You are welcome to shower (towel provided) as well, so bring along something comfortable to change into and we’ll hang onto it until you get back. Please preregister for this ride.